Stock Photo of Alaska cruises. 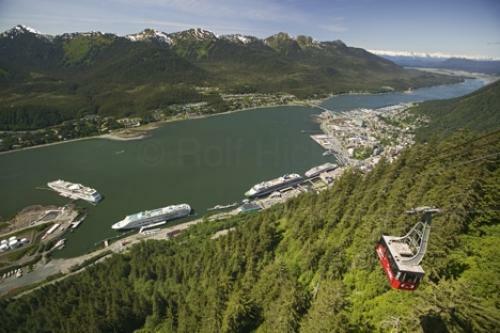 Juneau is one of the most important ports for Alaska cruises. Tourist can enjoy a lot of different ship to shore excursions which include glacier helicopter tours, sea kayaking adventures, shopping, trips to tracy arm just to mention a few. Alaska cruises are an important industry for the economy, especially in south east Alaska, the so called Inside Passage. During the peak of the cruise season, the Gastineau Channel is full of cruise ships and the streets are bustling with passengers shopping or on shore excursions. Photo of the Juneau Cruise ship terminal with 3 alaska cruises docked, Alaska, USA.